Frontispiece of ‘Du Clavecin magnétique’. 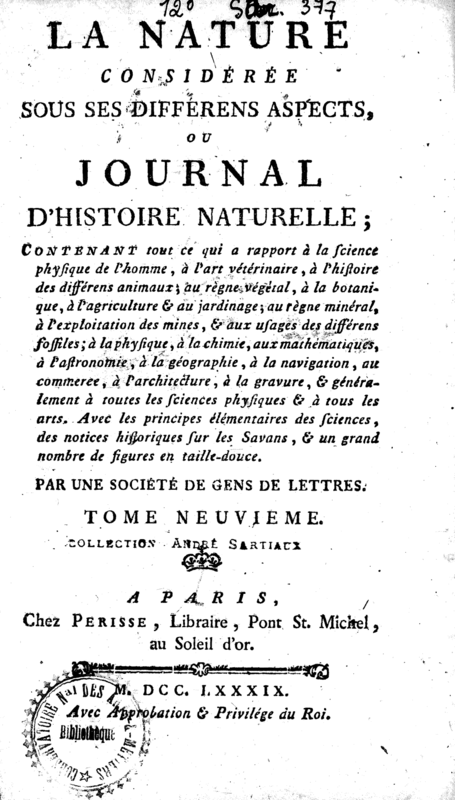 by M. l’Abbé Bertholon – Bertholon, Published in Paris 1789. “Those things that really excite curiosity are often likely to be the subject of greatest utility. The history of science & art could provide several examples of this truth: when the Philosopher Thalès of Miletus, six hundred years before our era, discovered the property that when amber was rubbed it attracted small objects, no-one was tempted to believe that this discovery was anything but a vain & useless phenomenon; & we were far from understanding that this property, so small in appearance, may one day lead the bold race of Prometheus, to drop at will his fire from heaven, to divert lightning, and to master it in many ways. With what was haughty scorn would some of the ignorant contemptibles have shown to this illustrious philosopher, the founder of the Ionic sect, when they saw him busy and seriously rubbing amber to attract small straws? This however is the first phenomenon of electricity, we will need to use all of our knowledge on the subject to achieve the art of preserving lightning and even to provide the cure of some chronic diseases until now have rebelled against remedy. The first discoveries of aeriform fluids, known as Gas, have also seemed strange and yet they led us to the knowledge of certain mineral waters, the art of how to cure cancer & dissolve [kidney] stones etc. Could the first person to observe that magnets attract iron & have conveyed to him their virtue, have imagined that one day, using an iron or steel needle, that he would brave the fury of this treacherous element and the needle, by flying from one pole to another allow him to strike out on unfamiliar roads. Those who are involved in the search for truth, must ignore the curses of blasphemous people, and continue to question with a stubborn confidence the oracles of nature, because all knowledge is related to each other and interlinked. The discovery of the magnetic harpsichord would always some interest, when she was only an object of curiosity, since all the truths are valuable, and that they lead almost always has benefits far at least, whatever the weak eyes can glimpse. But it’s not just the degree of usefulness provided by the magnetic harpsichord, there are others that immediately arise. Everything that is capable of producing movement in the universe and can effect different bodies either immediately or delayed, and move without visible touch if necessary, unquestionably cannot be ignored. We know several different types of Harpsichords [‘Clavecin’]; the ‘Ordinary Harpsichord’, the Ocular Harpsichord, & the Electric Harpsichord [‘Clavecin Électrique’]. The first is a purely acoustic stringed instrument; the second one once created quite a stir. Pére Castel [Louis Bertrand Castel -15 November 1688 – 9 January 1757 French mathematician and inventor of the ‘Clavecin Ocular’ ], is famous for the products of his brilliant imagination, compared the seven colors to the seven tones of Music. When two [of these] instruments are played and run in parallel it would create a new harmony, a melody of sounds corresponding to their colours. This famous Jesuit [Pére Castel] does this purely to give the deaf the same pleasure that we feel from music. We would have been able to play music, using only colours, the same tunes we have heard on an ordinary harpsichord – there would be sonatas for the eyes as there are for the ears: the soul of the blind could have experienced the same enjoyment from the sounds as deaf by the eyes; & both experience the same piece of music, since it could have played to the eyes a Piano, an andante, a presto, a prestissimo, as we play to the hearing. The third harpsichord which I previously mentioned is the ‘Clavecin Électrique’ of Pere DeLa Borde[the Jesuit priest Jean-Baptiste Delaborde of Paris, France, inventor in 1759 of the Clavecin Électrique ] . It consisted of a single rod of iron on silk cords [the beater], with bells of different sizes for different tones. Two bells were combined in unison for a single note, one has suspended the iron rod with a brass wire, and the other with a silk cord. The beater is suspended by a silk thread and falling between two, etc. by electrifying the lever, the machine was put into play if each key meeting its lever, and each lever to its timbre. The new harpsichord that I have imagined for some time is the ‘Clavecin Magnetique’, which has nothing in common with, and a very different structure from the preceding instruments. The whole machine is based on magnetic attraction of the physical spirit; that is – it attracts, & shakes iron battens hanging in balance with a range of tuned bells between them. You can hear tones that have known relationships, and suites of tones that form a nice melody. For this effect, simply press the keys, lowering the end of a few levers which raise the other end on which is placed a bar magnet held in position by two parallel & perpendicular frames pierced by holes for receiving the bar magnets: the upper end of each bar, rising for each corresponding pitch, attracts the batten which is hanging out & to the side: This attractive force knocks the bell & creates it’s own sound. . 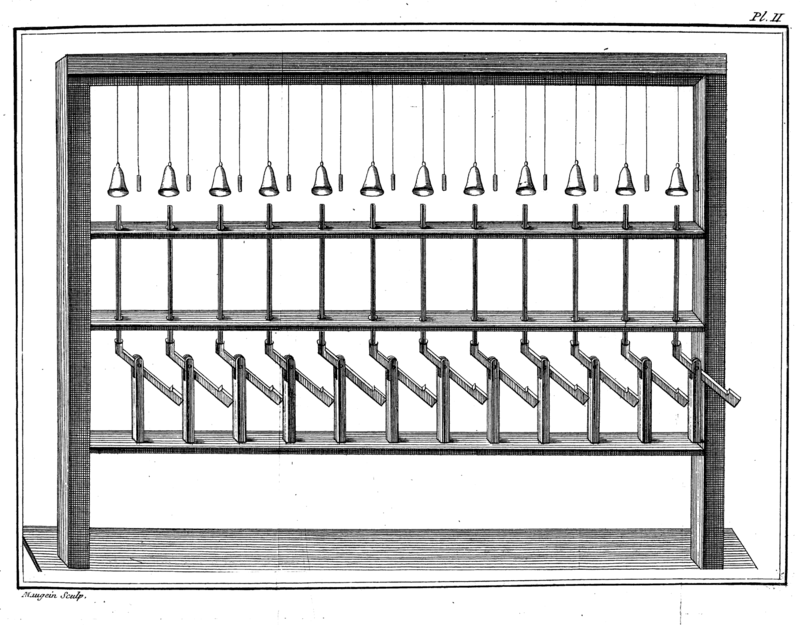 If two bells are played in unison, the third, the fourth, fifth or octave, being struck by the movement of the lever, we will hear these corresponding tones, and therefore we, can play different tunes, that is to say, we hear, singly or in succession, a series of tones that will have a definite relation between them. The soul of the movement that produce sounds in the harpsichord, the physics engine is the magnetic attraction, which have not yet been used to produce this effect we will have a magnetic harpsichord. The physical engine and the soul of the movement that produces the sounds in the harpsichord is magnetic attraction, which has never before been used to produce the effect that we have in this magnetic harpsichord. The action of the magnet exerts itself, as experience shows, despite the interposition of all objects except iron: and the attraction takes place, whatever has been put between the attracting object & attracted object; gold, silver, copper; or any other metal that does not contain iron, even though there is between them glass, wood, stone and other animal products, vegetable or mineral. What are the facts which form so undeniable experiences. Let us assume now that a patch of glass or copper & a clapper of metal are suspended near each other, it is clear that bar magnet, which rises in the interior of the bell at the height of the clapper attracts it & the clapper will hit the bell, which will result in a sound, and that this effect will still take place, where distances can not be too large, but proportional to the attractive forces. If two bells are played in unison, we hear that each of them will resonate; they are likely to have an effect each other, such as the octave, the third, the fourth or the fifth, we hear the formation of a regular harmony when played at the same time or a nice melody if they are played successively. And it can make all sorts of sounds, it will be able to play all the tunes that you will want, if it was a series of bells in the key of ‘tri’ & stored in the order of succession & natural tones sharps & flats, in a manner similar to that of different Musical instruments, it will result in a true magnetic harpsichord. Bertholon’s engraving of the workings of the ‘Clavecin Magnetique’ referred to in the text. The first figure represents the bell F G with the clapper G, suspended on I rope or rod H K. The magnetic bar is carried by the end C of the lever CD , and the lever, which is supported by its axis A & its fulcrum, is pivotable, when a finger is pushed on D: The whole thing is supported by the pivot BA; & as soon as we stop this pressure, the weight of the bar makes the lever fall, and there is no more attraction. We see in the second figure that the same magnetic bar AB, placed horizontally, may, when it is high in C, D, attract. at the same time the clappers F, E, which then hit the bells C D. To produce this effect, simply lower the G end of the lever. Since it can be very difficult, and consequently very expensive to find a large number of silver bells or even copper or brass, which give different tones in desired relations, one can order the base of the cups as in B, 3, and select a number that can give several series of octaves. To explain more perfectly, we can put more or less water in those cups that would render the desired tones. Then, by raising the tip of the bar magnet C at the height of the clapper A, the tone that one wants will be made. Figure 4 corresponds to Figure 2, and show that the AB bar being placed horizontally, it may, by a single movement G, raise the bar to the level of the two clappers C, D & pull together to sound two tones in unison, octave, or third, or fourth, & , accordingly the base of the cups will be selected. The arrangement as seen in Figures 2 and 4 give the complete instrument dimensions that by their size would hit awkwardly. To make this more readily understood, we represented the length of the bars in a position parallel to the width of the body of the man who plays the instrument; but if we place the bars in one direction always parallel to the horizon, and perpendicular to the direction of Figures 2 & 4, then the portion of the instrument; between D & C, in Figure 4, we have, instead of the whole length, the width of the plank upon which the cups lie, is perhaps equal only to these. In this case you can store quite a large number of bells or cups in size equal to the extent that one can easily browse with both hands to press the buttons D, G, G, G.
Figure II of the board is a line or row of bells in the simplest arrangement, to avoid confusion it is a series of bells, such as one sees one in Figure I, Plate I. It is understood that one can play a simple tune, if you have a diatonic or chromatic series of bells. Two planks drilled with corresponding spaced holes always retain the perpendicular position of the various magnetic bars. We can, according to this arrangement and that of figure2 and 4, design a third engraving where the same bar would move at the same time. two clappers would hit each bells in agreement. It can be seen in the second diagram that each clapper is closer to one than the bells neighbouring bell, so that when the clapper returns after attraction, we can not hear a second sound. If we still assume that the bells & clappers are arranged in parallel lines between them, but gradually higher than the first line of bells & clappers of the second board, we can, in a small space whose depth is increased , have a double, a triple, a quadruple row etc. of bells, if there are two, three, or four of these lines. In this way it will be easy to place several corresponding levers in a very confined space, so that there are some keys in rows above the other; & then the harpsichord be no larger than the ordinary instruments of the same name, it will be easy to play the harpsichord, and even to make it portable. When the bar magnets have lots of energy, their attraction is very strong, and because the distance between them and the clappers are small, it sometimes happens that after the first shock & after oscillation or vibration, the clapper can still hit the bell. To turn it off you can use a type of damper or shock absorber. For this purpose, between the node 1 &, Figure I, there is a pulley on which is passed a small wire or cord attached at one end to a point between A & D, while the other end of the wire will be armed with a small piece of cloth with a lead ball for ballast. 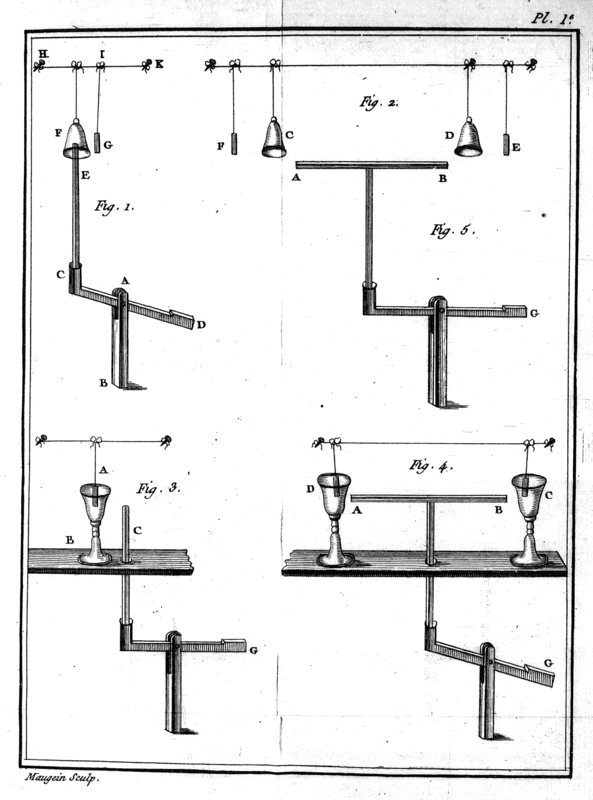 This being so, it is obvious that every time we push down the rocker lever D, it will raise the shock-absorber, and the shock will be made; but once you press the more preferred key, the weight of the bar by the action of the lever in opposite direction, the shock-absorber descends & will be between the clapper & the bell; it will then ascend, and allow free play. I then found a way to make a more accurate alternative to the rise and fall movement of the damper, by fixing a wire or cord that passes over the pulley, so that one of its ends is attached between A & D, and the other end between A & C, and that a piece of cloth is placed positioned at the corresponding part of the cord between the bell and the clapper when the C lever is lowered.